ORANGE COUNTY, CA August 5, 2014 — Orange County’s Rigo Santana of Xtreme Xcellence Detailing, has been handpicked out of thousands of detailers nationwide, as a member of the celebrated Air Force One Detailing Team led by master detailer Renny Doyle of Attention to Details. Meguiar's, Inc. has become one of the world's leading surface care products companies. Xtreme Xcellence is a full service eco friendly Orange County auto detailing company, and their methods are unique. Offering several advantages to classic car owners seeking high quality mobile auto detailing services in Orange County. 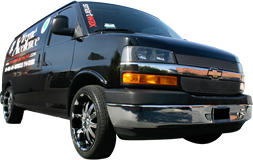 Xtreme Xcellence Professional Detailing is the specialist in mobile detail in Orange County and Los Angeles. Xtreme Xcellence are certified Orange County detailers from Detailing.com. Why try to guess how to properly detail your car? Our Orange County auto detailing experts do it right the first time for you. Xtreme Xcellence is dedicated to providing the best Orange County mobile auto detailing services and satisfaction to our clients and we can prove it! Over the past 13 years, Xtreme Xcellence has achieved many certifications and achievements in the mobile auto detailing industry and has also formed alliances with many local Orange County charities including Grace for Vets. Our commitment to the environment also shines in our eco friendly detailing services and our Certification as a Green Small Business. Our auto detailing Orange County customers are also thrilled that Xtreme Xcellence offers Green Friendly car discounts! Call us today to take advantage of our auto detailing services in Orange County and surrounding areas! The difference between driveway washing and an eco-friendly alternative. Demonstration on affects of using fabric protection on your interior upholstery. Xtreme Xcellence is proud to be part of the SEMA showcase and of the deserved recognition given to Lexus for excellence and automotive design.